Today two ex-presidents of Latin America, Piñera of Chile and Pastrana of Colombia (supported by Calderon of Mexico who had to bail out at the last minute) are going to Ramo Verde jail near Caracas to visit Leopoldo Lopez. This is a no win situation for the regime. If it bars access to two democratically elected ex-presidents it will show itself as having things to hide from international scrutiny on Human Rights (1). If it allows Piñera and Pastrana into Lopez cell, then we will have an international credible first hand account. Below a few tweets to try to show you the mood and tell you the story. Of course, a few chavistas protesting the visitors had to be seen. Chavistas protesting against Human Rights, there you go! Entry is refused. The regime choosing the worst option. Surprise? Not! And there you go. 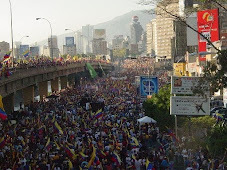 Pastrana "if this happens to two ex presidents what can the Venezuelan people expect?" Reminding the world that during Venezuela's democratic years Chavez received visits from whomever. But under chavista neo-totalitarianism, there is no such thing for political prisoners. And to conclude: Piñera "if Maduro wants to be respected, he should learn to respect first". Lapidary! Piñera and Pastrana have now a first hand account, a direct witness position on repression in Venezuela. They saw the Nazional Guards everywhere, they were both somewhat threatened by diverse hecklers and possibly by "security", they experienced personally the harshness and autism fo the regime, etc, etc. This was of course done on purpose as it is inconceivable that Piñera and Pastrana would have tried such a thing without consulting their governments, and maybe others. This is a clear message to the Venezuelan regime. I am afraid they are not getting it. I am afraid they have resigned themselves to become the lone pariah of our continent now that even Cuba is trying to get out of that status. 1) democratically elected is stressed here as both Pinera and Pastrana won from the opposition. Thus, technically, with odds against them. Daniel please correct typo in title "advert" should be "avert"
"Sí Maduro quiere respeto debe aprender a respetar primero"
Methinks a better translation would be "If Maduro wants to be respected, he should first learn to respect." or "if Maduro wants others to respect him, he should first learn to respect others." A minor improvement to a very good blog. "Piñera states that the vice president blocked the event (of course, Maduro run away cowardly to China to avoid doing it himself)"
He ran away to Saudi Arabia not China. According to Twitter they told them that Maduro was not in town & nobody could authorize the visit. Ha, ha. They've known for the days that the visit was going to happen. If they had just left them alone & allowed the visit there would have been a few comments & within an hour forgotten. Now all the international press will be talking about them blocking ex-presidents from visiting him. The story will get a lot more mileage. Better to get it out fast. Mistakes of translation can be corrected. In any event, mistakes of translation are trivial compared to mistakes of fact- which should be gone over carefully before posting. You have beat the others. So much for the Chavernment trying to win friends and influence people. Shows that Twitter is an important news medium these days,. Meanwhile, Maduro went to Saudi Arabia , converted to Islam and traded Cilia for 4 goats as their religion allows (Remember, I am Charly). As a new convert, he stroke a deal to import plenty of Arabian sand to repair roads, to be paid in oil exports of course. Each Venezuelan male with access of CENTOEX will be entitled to four wifes with the dowry paid at an exchange rate of 6.3 to the USD. Daniel, considering the seriousness of the situation, when will you and your colleagues, Caracas Chronicles, Devil's excrement stop commenting the situation with the seriousness it does not deserve and treat the country's ordeal in a Monty Python mode, it is about time. I try Writing with humor about half the time. My latest approach is to participate in a campaign to request the UN get involved in Cuba and organize popular elections to allow the people to vote for the dissidents they wish to be invited to meet with the yankee lady who is negotiating diplomatic relations with Raul's dictatorship. Having dissident leaders elected by the people will be a positive development. This way the Obama can hear what they think and the dictatorship will know it's beating and jailing the top troublemakers. The UN, of course, would only organize the elections, but it would withdraw and remain absolutely silent as the human rights abuses continue. Agree with Fernando. This is serious business. Try to connect the dots to Argentina's prosecutor death with the Venezuela-Iran-Argentina axis. It´s about time these crooks are exposed. Until Lula da Silva or José Mujica get involved visits of other Latin leaders will carry little weight inside the Venezuelan regime. Still this exposes the regime to further ridicule and isolation. This was not a wasted visit. It served a useful purpose outside of Venezuela. It's another nail in the myth of a democratic Venezuela. The press across Latin America covered this and the coverage placed Venezuela in a very unfavorable light. Please correct me if I'm wrong, but didn't Jose Mujica say on one of his most recent trips that he accepted the need of Maburro to have political prisoners but he asked that they be treated a bit better.....or words to that effect in which case no one in the oppo should have anything to do with this (insert your own choice words)! Regarding Pepe Mujica: he and his government operate on the assumption that "there are no enemies on the left." Venezuela News & Views: No “Patria Grande” for Latin America: the Uruguayan example. Caracas Chronicles: ¿Te acuerdas, Quico? Magic said it was "a disgrace" that there were political prisoners in Venezuela. Here's his exact quote. “En términos genéricos le he pedido (a Nicolás Maduro) siempre bondad hacia los prisioneros y un trato muy preferencial hacia los prisioneros de carácter político, que es una desgracia que tenga que tener’’, dijo Mujica en una rueda de prensa celebrada en la sede de la central obrera uruguaya. I certainly think he can do better for sure. My argument is more that the only thing that may shock Maduro & Company is criticism from Mujica or Lula. Brazil has distanced itself from Venezuela under Rousseff. Still it is evident that wheels are coming off and while Latin American countries are loathe generally to inject themselves into the internal affairs of other Latin states (Chávez was exceptional in this regard, he intervened in just about every country at some point or another), they may not have an alternative. Venezuela is collapsing. To just sit and watch it implode becomes increasingly harder to do. Charles Lemos, thanks for the Pepe Mujica quote. There is another interpretation of "que es una desgracia que tenga que tener:" "it's a disgrace that one must have them" could also become "It's a necessary evil." If Pepe Mujica drove up the the prison and wanted to see LL, it would be difficult to refuse him. All Latins are hesitant to intervene in the affairs of other Latin nations but there comes a point where morality dictates something be done. Mujica has the moral clout that few others have, not just in Latin America but across the world. Moreover, he was a former political prisoner and so can personalize the experience more than others. There is a freedom that former presidents have that sitting ones do not possess. For example, while in office Henrique Cardoso, César Gaviria and Ernesto Zedillo all tow the US line on drug policy but as ex-presidents they have been very vocal on the absurdity of a failed 40 year war on drugs. Mujica's term end March 1st. I hope that post that date, he become more vocal and candid on the unfolding tragedy that is Venezuela. Also curious if anyone else saw the article in the Spanish newspaper ABC on the defection of Major Leamsy Salazar to the US and who is leveling charges against Diosdado Cabello of running a drug cartel called Los Soles. No way Mujica is going to visit LL. Don't ever trust him. One of the reasons I don't is because of his behavior towards Venezuela. He has visited Caracas or invited Maduro to Montevideo to give him the blessing of the Latin America's left. His name as a now-democratic ex guerrilla fighter is sufficient. He defends Maduro whenever possible. And he will be busy campaigning for his wife as Mayor of Montevideo City and was elected Senator and will be assuming this new role the moment he hands the Presidency to Vázquez. Vázquez leads one wing of the Broad Front considered moderate, while Mujica leads the wing which calls for a Bolivarian revolution in Uruguay. Do you still think he will visit LL? On the other hand, we have a psychic called Marcelo Acquistapace that has predicted that LL will be the next president of Venezuela and that Maduro will not be able to finish his term and earlier elections will be called. Thanks for recalling my article, Boludo Tejano! And a sip of yerba mate to you, Maria. I consume a kilo a month of the stuff- though I don't do it with the metal straw. May the dog´s and cat´s Sing!